A large part of that perspective is what made Moneyball so personally enjoyable for me, in that it’s about people who when faced that brutally unfair economic discrepancy, chose to fight against it. Based on Michael Lewis’s excellent and literally game-changing 2003 bestseller (and which, according to a recent interview on The Daily Show, Lewis thought was unfilmable), the film tells the story of the Oakland Athletics (or A’s) 2002 season, where the team, under General Manager Billy Beane (Brad Pitt), tried to buck the entire system by fielding a team based on certain key statistics rather than traditional predicators of success and failure. In the process, for better or worse, he helped change the game of baseball. 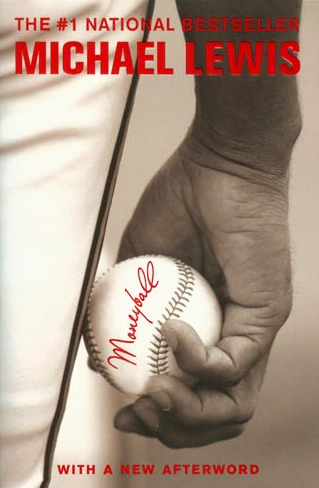 Michael Lewis's "Moneyball: The Art of Winning an Unfair Game" 2003 - Possibly the best and most influential sports book of the last decade. After being eliminated in a nail-biter from the 2001 postseason by the New York Yankees (who had nearly three times the A’s talent budget that year), and facing the loss of his three star players – Jason Giambi (a future Yankee), Johnny Damon (ditto), and Jason Isringhausen – Beane finds himself needing to completely overhaul his team and somehow make them competitive again heading into the next season. Of course, in his way is the same glass ceiling that gets him every time: money, and the fact his team doesn’t have enough of it to compete for the top talent. Also breathing down his neck is the fact that if he’s not successful, he may find himself out of job with no other places to go: all he has on his resume is a high school diploma and a spotty record as a member of the front office of a small market baseball team. 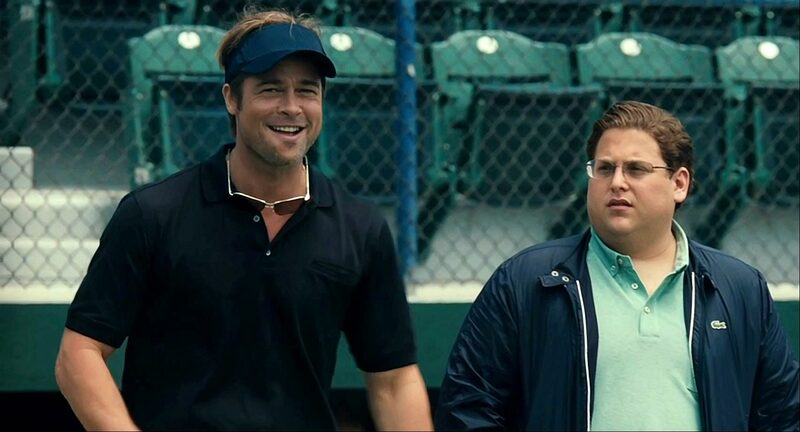 Brad Pitt as A's General Manager Billy Beane (left) and Jonah Hill as Peter Brand (right). Brand's character was actually an amalgam of a number of Beane's assitants and advisors from the 2002 season. Despite his urgings to think outside the box, Beane’s scouts try to assemble a team based on traditional standards. In some cases, their approaches seem sound, such as trying to get the best player for a position that you can. In others, however, their reasoning on why they should sign certain players have little to do with baseball; in one instance, they sound like they’re casting a television show (“he has a good face – it’ll draw the ladies”), and in another, they seem to employ outright quackery (“he has an ugly girlfriend”). 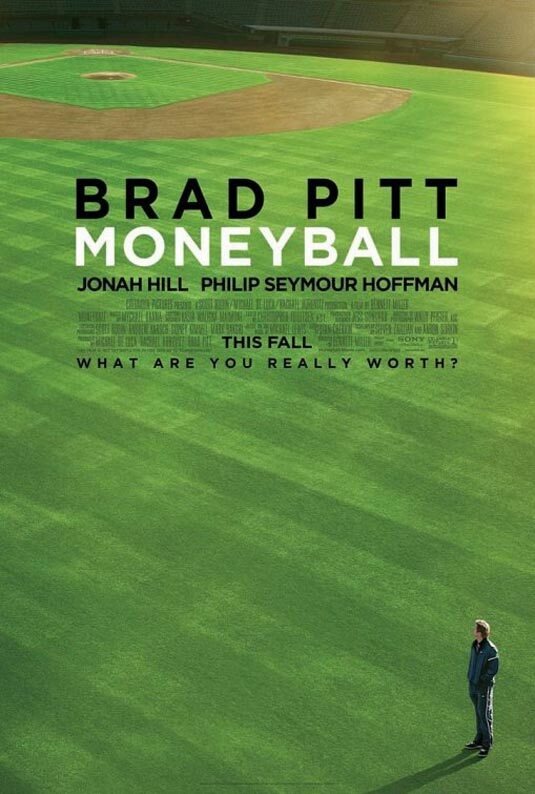 On a subsequent trading mission to the Cleveland Indians, the frustrated Beane comes across Peter Brand (Jonah Hill), a fresh-faced young Yale graduate with the inspired idea to use statistician Bill James’s sabermetrics method to create a winning baseball team. Recruiting Brand to his outfit, Beane begins putting Peter’s ideas into effect. On the surface, Brand’s plan is simple: instead of overspending for stars or potential stars who field well and can regularly hit home runs, hire players who can consistently get on base, no matter what the other indicators – age, injuries, reputation, appearance, “star power” – may say about their viability. Simply put, Beane and Brand theorize that its how many runs you get that wins games, not how you get them, how long it takes to get them, or how much you give up while getting them. Naturally, these ideas draw the ire and chagrin on the scouts, whose livelihood is based on the perpetuation of their approach, and especially the disdain of team manager Art Howe (Philip Seymour Hoffman), who doesn’t want to risk future employment enacting Beane’s vision. Beane, on the other hand, very willingly risks his reputation and his career on his plan ultimately working, and the film does an excellent job detailing the twists and turns the season takes as he struggles against Howe and public pressure to make sure his strategy gets a fair shot. 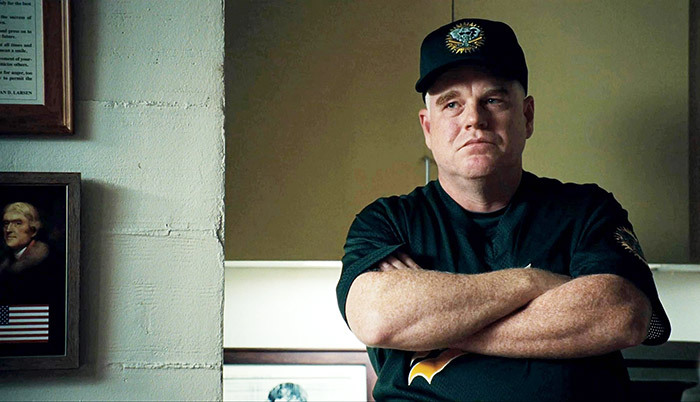 Philip Seymour Hoffman as Manager Art Howe. Not surprisingly, the real Howe is very critical of his portrayal in both Lewis's original book and in the film. Where Moneyball begins as a somewhat old-fashioned sports movie is that it is ultimately about an underdog team fighting against the odds to win the championship. But that’s also where the comparisons to your typical sports movie end. Much like Beane’s strategy to turn his team around, the film doesn’t focus on the players, the coaches, or even individual games all that much (Beane is shown as so superstitious and neurotic that he can’t even watch them). It’s not about the skill of playing, the skill of coaching, or the camaraderie of players. Instead, it’s told from the very unique perspective of Beane and his machinations, his use of statistics and strategy, as well as his locker room interactions with players and other personnel who are trapped in the very mindset that Beane is trying to turn on its ear. It’s as much about philosophy and corporate politics as it is about actual sport, and in being so, it becomes one of the more authentic and honest sports films you’ll ever see. (This is not to say that Moneyball isn’t still highly fictionalized: “Peter Brand” is an amalgam of a number of real life individuals, and the real Beane began incorporating sabermetrics into his approach when he took over the Athletics in 1998). It’s to the great credit of director Bennett Miller and the excellent writing of Steven Zaillian and Aaron Sorkin (who worked separately on the script from a story adaptation by Stan Chervin), that it remains as exciting as just about any baseball movie ever made, and a great deal more thoughtful to boot. In the end, though, it’s the fact that it feels so human that it ultimately works. Pitt’s performance as Billy Beane may be the best work of his career; though Beane is often forced professionally to be a self-distancing hustler who hides his feelings at every turn (though not always successfully), even from the daughter that he loves, Pitt does an amazing job in the contemplative moments at hinting at the motives and passions at play behind Beane’s eyes; very often he’s able to say more without dialogue than with it. In truth, that can be said for much of the film itself, in that it makes many of its core points, including Beane’s motivations for wanting to change baseball, through allusion and subtlety instead of through stating the obvious. Like Beane’s strategy for earning runs, the film scores by setting things up a bit at a time, and not by trying to swing for the fences every time out (which makes the rare time it does so count all the more). It’s the very rare movie (and even rarer for a sports movie) that rewards not only our attention and passion, but our intelligence. What I appreciated most about the film, though, is that while being refreshingly honest and unsparingly about the administrative, personal, political, and economic nature of baseball, it’s ultimately not very cynical about it. Despite the film’s title, Billy Beane does what he does because he loves his daughter, he loves his team, and he loves his sport. And in showing us that, the film reminds us of why, despite the scandals, the unfairness, the prima donna stars, the ludicrous salaries, and the continued existence of the Boston Red Sox, we still love baseball: because on or off the field, it’s always about how you play the game. Posted on October 10, 2011, in The Antiscribe Appraisals (Reviews) and tagged art howe, baseball, billy beane, brad pitt, jonah hill, michael lewis, moneyball, movie review. Bookmark the permalink. Leave a comment.